An elusive species of fish unique to the California coast has captured the interest of Seaver College biology professor Karen Martin, her students, and the entire seaside community. Along a narrow strip of the Pacific coast, shortly after the evening's highest tide, the shoreline begins to sparkle with silvery light every spring, heralding the start of one of marine life's most spectacular phenomena. Each year throngs of California grunion, small, sardine-size fish found only along the southern coast of California and parts of northern Baja California, swim, or “run,” to shore as part of their unusual spawning ritual. The annual occurrence often lasts through summer and draws curious audiences eager to catch sight of the magnificent fish species that has intrigued both scientists and spectators for centuries. With each new or full moon, a small group of male grunion catches a wave onshore and, swell-after-swell, is joined by as many as thousands of others, males and females, that may eventually blanket the beach with their flopping, luminescent bodies. The mating “dance” lasts anywhere from a few minutes to an hour or more, when females burrow themselves in the sand to deposit their ova, sometimes up to 3,000 at a time. Drawn to their fascinating motion, the males wrap themselves around their mates to fertilize the eggs and quickly return to the surf. While females make the journey to shore only once, males return several times to repeat the process. The eggs, which are buried inches beneath the sand, incubate for 10 to 12 days until the next high tide washes them into the ocean to hatch. Seaver professor Karen Martin, the region’s best known expert on grunion, has been studying the small and slender fish for about 20 years and first became interested in the species while researching fish that come out of water for her doctoral dissertation. 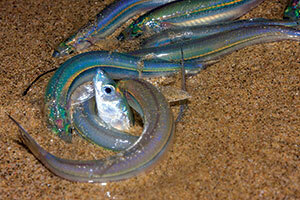 Grunion are famously elusive and are one of the few species of fishes that come out of water to spawn. Because of their inability to be found when not on shore, they are also difficult to study. 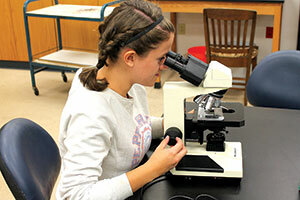 It wasn’t until Martin began teaching at Pepperdine that she revived her investigation of the beach-spawning fish. Her research now focuses on their early development, the grunion’s most vulnerable period of life. The life span of the grunion is two or three years. Humans pose the greatest threat to their short- and long-term survival. As the executive director of Grunion Greeters, Martin and colleagues first organized a team of volunteer citizen scientists in 2002 to study the human impact on the fish’s habitat and collect data during spawning runs that is later used for research and management. The group formed after members of the public became concerned about the way that the beaches were being maintained in San Diego. “A local citizen noticed the way that they were raking beaches and thought that they were probably going to cause harm to the eggs that were buried in the sand after the grunion had run,” she recalls. With the aid of residents, scientists, public agencies including the California Department of Fish and Wildlife, California State Parks, the National Marine Fisheries Service, NOAA, and local governments, and volunteers, the results of the initial study of beach grooming practices prompted significant change in official procedures in San Diego and other cities throughout California. The Grunion Greeters also make recommendations for the vehicles that patrol the beaches and the ways the beaches are maintained that will protect the areas where grunion nests are located. A closed season allows the grunion to be able to reproduce without any interference from people onshore. Hunting is prohibited during April and May. To give grunion more of a chance to survive during the open season, restrictions on how they can be hunted were put in place in 1927. 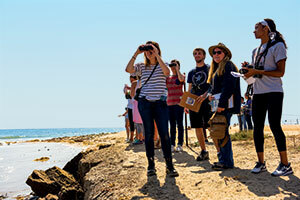 Currently at Pepperdine Martin, along with colleagues from UC Santa Barbara, is establishing a citizen science program called All Ashore, an initiative that will engage students and local volunteers in monitoring sandy beaches and examining their ecology to educate and help the community understand the kinds of organisms that they might find there. It will provide a comprehensive look at all the animals and plants, not only grunion, that inhabit the sandy beaches in Southern California and partner with organizations up and down the coast, including aquariums, environmental organizations like the Surfrider Foundation, Heal the Bay, and Santa Barbara Channel Keepers, as well as other groups. Martin and her colleagues are also developing a web-based questionnaire to survey the beaches in preparation for training sessions and workshops for citizen volunteers to collect data. Seaver graduate Vincent Quach (‘14) is helping Martin with this program and junior Emily Pierce, who participated in Pepperdine’s Summer Undergraduate Research in Biology program, is taking part in researching the hatching process of the grunion to understand how they are able to hatch so quickly. Pierce’s first experience with grunion took place during a run last summer and reinforced her research pursuits. along with Seaver journalism professor Michael Murrie, Martin produced Surf, Sand, and Silversides: The California Grunion, an award-winning, short educational film about California grunion that was screened at film festivals and is available for educators.